Sharp Aquos R2 compact has IP68 dust/water proof (up to 1.5m for 30 mins), It contains IGZO IPS LCD capacitive touchscreen, 16M colors, it offers a size of 5.2 inches, 67.5 cm2 (~80.5% screen-to-body ratio) that is very suitable for playing games, watching videos & browsing the internet and it contains a resolution of 1080 x 2280 pixels, 19:9 ratio (~485 ppi density). Sharp Aquos R2 compact has a high pixel density, It offers a high resolution that makes the display very clear & bright, It presents a multitouch feature, It includes Corning Gorilla Glass 3 for the screen protection, It supports 120 Hz, It has HDR10 and it presents DCI-P3. Sharp Aquos R2 compact has the latest operating system of Android 9.0 (Pie), It has Qualcomm SDM845 Snapdragon 845 (10 nm), It offers a fast CPU, It presents Octa-core (4×2.6 GHz Kryo 385 Gold & 4×1.7 GHz Kryo 385 Silver), It has Adreno 630 and it presents a superb performance without any lags. Sharp Aquos R2 compact has a superb expandable memory via card slot, microSD, up to 512 GB, It comes with a high internal memory of 64 GB, It has a great 4 GB RAM that is very useful for multitasking performance, It offers lots RAM & a large memory. Sharp Aquos R2 compact has the main camera of Single 22.6 MP, f/1.9, 22 mm, PDAF, OIS, It has features such as LED flash, HDR, panorama, It takes amazing photos with high quality, It has 4K video recording, It has a video of [email protected], [email protected] (gyro-EIS), It contains a selfie camera of Single 8 MP, f/2.2, 23 mm, video of [email protected], It offers a superb selfies. Sharp Aquos R2 compact has 2G bands GSM 850 / 900 / 1800 / 1900, It offers 3G bands HSDPA 2100, It contains 4G bands LTE, Speed is HSPA, LTE, It contains GPRS, It includes EDGE, It is announced in 2018, November, It will Come soon in 2019, January, It offers a premium & impressive design. Sharp Aquos R2 compact provides you with body dimensions of 131 x 64 x 9.3 mm (5.16 x 2.52 x 0.37 in), It has a light weight of 135 g (4.76 oz), It offers a front glass, aluminum frame, plastic back, It contains Nano-SIM, It includes Sound Alert types such as Vibration, MP3 & WAV ringtones. Sharp Aquos R2 compact has a loudspeaker, It provides you with 3.5 mm jack, It has a superb active noise cancellation with dedicated mic, It contains Dolby Vision & Dolby Atmos, It supports 24-bit/192kHz audio, It presents Comms WLAN such as Wi-Fi 802.11 a/b/g/n/ac, dual-band, Wi-Fi Direct & hotspot. 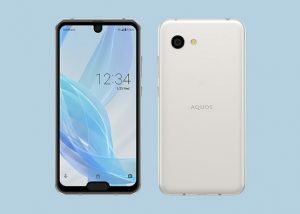 Sharp Aquos R2 compact has Bluetooth 5.0, A2DP, LE, It presents GPS, with A-GPS, GLONASS, GALILEO, QZSS, It offers NFC feature, It presents USB 2.0, Type-C 1.0 reversible connector (PowerDelivery 2.0), It offers a rich number of superb sensors such as fingerprint (front-mounted), accelerometer, gyro, proximity & compass. Sharp Aquos R2 compact has a messaging methods such as SMS (threaded view), MMS, Email, Push Email, IM, It presents Browser HTML5, It supports a fast battery charging, It has MP3/AAC+/WAV/Flac player, It offers MP4/H.264 player, It presents a document viewer, It contains a photo/video editor and it has a high build quality. Sharp Aquos R2 compact has a non-removable Li-Ion 2500 mAh battery, It gives you misc colors such as Smokey Green, Deep White, Pure Black, It offers a flash that enables you to take amazing photos in low light conditions, It offers a premium & impressive design. Sharp Aquos R2 compact presents a great camera with many features, It has a high-end processor & graphics processor, It offers connectives such as Bluetooth, Wi-Fi, GPS, NFC, 3G, 4G & USB, It offers a fast & accurate fingerprint sensor. Sharp Aquos R2 compact offers better viewing angles & lower power consumption, It can capture amazing images without losing any details, It looks very premium in the hands, It provides you with an excellent & up-to-date software. Sharp Aquos R2 compact does not have Dual SIM, It offers Nano-SIM only, It does not have FM Radio, It has a non-removable battery, It offers an average battery, It does not offer Infrared, It does not have wireless charging, It does not offer a barometer or a temperature sensor. How can you save the battery power on an Android phone ?